The “maker movement” doesn’t end with arduino—that same DIY philosophy can also be applied in the kitchen. 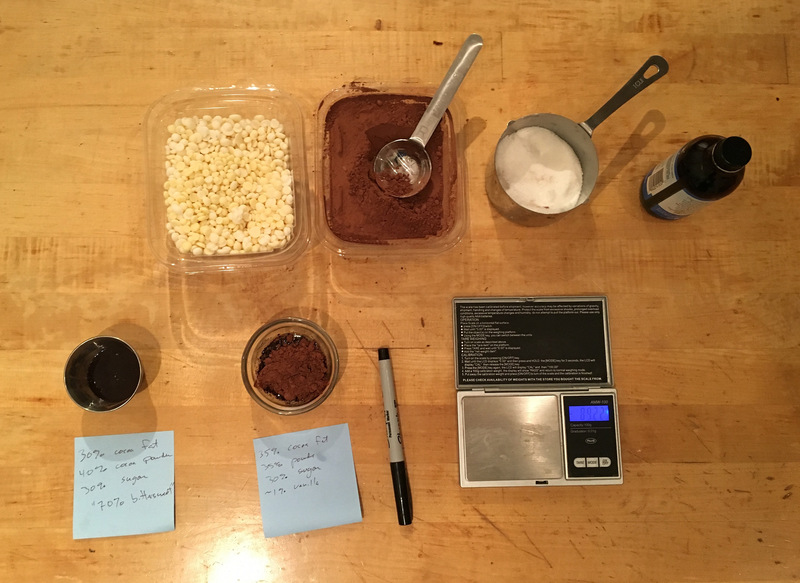 Jeff Potter, author of Cooking for Geeks: Real Science, Great Cooks, and Good Food – Second Edition, talks about how to make sour cream, chocolate bars, rolled oats—and even liquid smoke—from scratch. And, if you happen to have a mass spectrometer handy, there’s a bonus: how to tell the origin of your tomatoes. Read an excerpt. IRA FLATOW: This is “Science Friday. I am Ira Flatow. You know, there are a lot of kitchen experiments you, as an amateur scientist, can do at home. For example, ever shaken a jar of heavy whipping cream until it separates into butter? It’s pretty easy. They even do it in kindergarten. Right? But it’s also kind of mind-blowing, the realization that, hey, you can actually make this stuff, real butter, it’s not just something that comes prewrapped in the refrigerator aisle. And it tastes a lot better too. So you walk around the supermarket these days, and you’ll see, there’s a lot of stuff, there’s a lot of stuff. They’re products people use to make themselves, but they don’t do that anymore. Here’s looking at you, sour cream. My next guest is a ninja of those lost culinary arts. And he’s here with a few tricks to get more out of your cooking by doing it yourself. Jeff Potter, author of Cooking For Geeks, Real Science, Great Cooks, and Good Food. He’s out with a new edition with new experiments you’re going to want to try. And you can find a few at sciencefriday.com/cookingforgeeks. Jeff, good to have you back. JEFF POTTER: Thanks for having me. IRA FLATOW: All right. If you’ve got any kitchen hacks of your own, or maybe a little science to improve your made-from-scratch recipes, you can give us a call. 844-724-8255. You can also tweet us @scifri. Jeff, there’s a lot of stuff in your kitchen these days. There’s one or two steps removed from their natural state. It’s almost there. Right? Minimally processed. I’m thinking like vanilla extract. But we’ve sort of forgotten how to make all this stuff. When did we lose that ability to make all this stuff? JEFF POTTER: I think a lot of that happened post World War II when we kind of got to two people in the family, both in the workplace and convenience of buying things from home. And there was that space age excitement of the modern go to the store and buy something. And you know, it’s actually amazing how much science contributed to the ability for us to make food. But here we are, 50 years after that point, and we’ve forgotten some things. So one of the great things I’ve had fun this last year doing is digging into, well, what happens? How can we do these things ourselves? JEFF POTTER: Well, vanilla is easy. IRA FLATOW: –an easy one. How do you make the extract. JEFF POTTER: You can just literally take vanilla bean, slice it open, and drop it into a small jar with a little bit of vodka. Vodka, being ethanol, is a great solvent. And this is how you make vanilla extract. IRA FLATOW: People would love to try that one. JEFF POTTER: It’s easy, I tell you. Especially if you’re cooking with the vanilla bean. Don’t throw it away. Drop it in a little small container with some vodka, and put it in the fridge or keep it for a week or two. And then you’ll have vanilla extract. IRA FLATOW: That’s great. There’s one condiment that people don’t use too often, but a really fun project to make. And that is liquid smoke. JEFF POTTER: Liquid smoke is fascinating. This is one of those ones that demonstrates some really great chemistry. It’s made fundamentally by taking whatever your smoke source is,– hickory chips, say– putting them inside a container that you then heat. And you take the smoke from that container, a closed container. We’re not talking about combustion. There’s no oxygen here. You heat it up. And that smoke you then direct through water. And that water will actually dissolve some of the smoke compounds into it. And that water ends up being what we call liquid smoke. And it’s got all the flavor compounds. And that begins to give you a little insight that sometimes these things that come in a bottle are actually very simple. Sometimes they’re not though. IRA FLATOW: Is it safer than actually grilling? JEFF POTTER: There is some thinking that, in fact, the liquid smoke should be safer, because a lot of the carcinogenic compounds end up either precipitating out or floating out and not being in suspension inside that liquid. IRA FLATOW: All right. I can’t hold back myself anymore, because I’m looking at some wonderful pieces of chocolate and other things that you’ve brought in. JEFF POTTER: Chocolate was another one of those fun ones to look into. And who could resist chocolate? IRA FLATOW: Not me, that’s for sure. JEFF POTTER: In this case, chocolate, as we think about it, that nice bar of chocolate that you see Charlie and the Chocolate Factory opening up, goes through a process called conching. And that process was invented in the 1870s by a guy whose last name was Lindt. Quite familiar to those of us who like chocolate these days. And that process really takes the cocoa fat, the cocoa butter, and sugar, and really grinds them together and away. But before Lindt came up with that process, chocolate was unconched. It had this texture that wasn’t smooth. It wasn’t really for eating. So you can kind of approximate this at home if you grab some cocoa fat, which is the same thing as cocoa butter, about 30%, 35% by weight, some cocoa powder, also 30% to 35% by weight, and the rest sugar. Melt the cocoa butter. Throw in the cocoa solids– the cocoa powder, that is– and the sugar and mix it up. And you’ll get something that looks a bit like that piece that you are looking at. IRA FLATOW: This round one? JEFF POTTER: That round one. So take a bite now. Keep in mind that before we had conching, chocolate was not really a great thing for eating. It was gritty. It didn’t have that fine texture. I mean, the flavor is interesting. And it’s a fun thing to try. IRA FLATOW: It’s good, because it’s not too sweet. JEFF POTTER: Well, in this case, that’s because there’s not too much sugar in there. IRA FLATOW: Not too much sugar. And it’s delicious. JEFF POTTER: I always know that bringing food into the studio is a great thing. IRA FLATOW: Now, when you see the cocoa content– you go out and you want to get these bars. They say 75%, 80%. What are they talking about there? JEFF POTTER: They’re talking about the percent of cacao product in there, which is a combination of the cocoa fat and the cocoa powder. They’re not telling you the ratio of those two different ingredients. So the other thing I brought in for you, you can see some little white pellets there. Those white pellets are just cocoa fat. I’m going to warn you, they’re not particularly delicious. They’re not white chocolate. It’s just the fat. How would you describe that? IRA FLATOW: But I can feel the texture of chocolate. JEFF POTTER: Yeah, it’s got the texture. IRA FLATOW: It’s got that mouth feel. JEFF POTTER: And the fats in chocolate are actually really fascinating. There’s a whole thing about polymorphism, the way they crystallize, the ratios of triglycerides in there. And it’s actually somewhat similar to butter, but not quite. So at 70% or 75%, when you see it on the bar, if you’ve got two different bars that both say 70% from different manufacturers, one might be higher cocoa powder, cocoa solid content. The other one might have less. IRA FLATOW: Is there any way to know that when you’re looking? JEFF POTTER: You might be able to be clever by backing out the fat concentration. I haven’t actually checked that one. I don’t think you can really do it realistically though at home. Maybe if you had some lab equipment. IRA FLATOW: And what happens when the chocolate hangs around a long time and it gets a little like a white film on it? JEFF POTTER: White film. So that’s called blooming. And there’s actually two different kinds of blooming that can happen with chocolate. There’s either fat blooming or sugar blooming. Most of the time, when you see white stuff, it’s fat blooming. That’s the migration of those cocoa butter, cocoa fat through the actual solid matter. If you look at a bar of chocolate, it’s actually a really complicated physical structure. You’ve got cocoa solids, which are particulate, suspended inside fat, which– most of us think about bars being solid. But the fats in there are a mixture of different triglycerides. And some of those fats are actually liquid at room temperature, not so much that you notice it. But they do migrate. IRA FLATOW: So it’s not unsafe to eat that. JEFF POTTER: It’s not unsafe to eat. It’s just going to have a texture that won’t be as enjoyable, because it impacts the texture. Melt it down, or use it in something to cook with. IRA FLATOW: As you know, we love to talk about microbes and fermentation on this show. So let’s talk about sour cream. Is that fermented? IRA FLATOW: Sour cream is fermented. JEFF POTTER: Sour cream, that’s what makes it sour. It’s bacteria. If you know how to make yogurt, you know how to make sour cream. Just use cream instead of milk. IRA FLATOW: My mind is just– it’s a mushroom cloud here. So can you turn regular cream into sour cream? JEFF POTTER: Yes. You take a regular container of sour cream. The easiest place to get the starter bacteria is from yogurt. So just get some live active cultured yogurt. Throw a teaspoon into the container, stir it up. And basically, let it, quote, unquote, go bad. You can let it sit on the counter overnight. If you happen to have a yogurt maker or a slow cooker that’s got a yogurt mode, that’s better. And the culture from the yogurt will chow down on the lactose and the other stuff that’s present in the cream. There shouldn’t be too much lactose in cream. But it’ll chow down on the stuff in the cream to actually make it into sour cream. IRA FLATOW: Will it get that gloppy consistency? JEFF POTTER: It won’t get quite as thick as maybe some of the sour cream you’re used to, because a lot of commercial stuff sometimes includes thickeners– corn starch or carrageen or guar gum. But you’ll look and go, oh, this is sour cream. IRA FLATOW: Our number, 844-724-8255, if you have questions about food science, which we’re talking with Jeff Potter, author of Cooking For Geeks, Real Science, Great Cooks, Good Food, out with a new edition with no experiments. What new things did you put in the book? Were there things that people asked you for? JEFF POTTER: Well, there’s a lot of different things. The second edition’s got over 150 pages of brand new material. So there’s a bunch of new interviews with folks, like Jacques Pepin, Deborah Madison, Bridget Lancaster, a number of chefs, who it was really a pleasure to speak with. There’s a whole section actually– we were talking about fats here. There’s a whole section I added in about fats. What are trans fats? How is that compared to what’s called a cis fat? What’s the breakdown of different fat sources? There’s new experiments. So if you’ve got a middle-aged kid, and you want to do a few things in the kitchen, you can do everything from calibrate your oven to calibrating your freezer, just using the physical properties of things like sugar or salt water. It was so much fun to go back and dig into it. IRA FLATOW: I’ll bet. This really is. And this is a really interesting section in your book. It’s not a do-it-yourself opportunity unless you happen to have a mass spectrometer lying around. But you have a section in the book that talks about how Sherlock Holmes would determine where a tomato was grown. JEFF POTTER: This one was really fun. We think of water as just being H2O. Maybe if you’ve got a glass of water, OK, there’s some air dissolved in there, and maybe some solids, some minerals. But even if you just look at the H2O, there are differences between different molecules. And these are called isotopomers. So if you think about oxygen, it’s oxygen 16, as in eight neutrons and eight protons. But you can actually have additional neutrons in there. So you can have oxygen 17 and oxygen 18. And that’ll change. Those isotopes will change the actual molecule of water. And those changes change the weight of the water. And that change in the weight changes the rate of evaporation. So the water that has the heavier isotopes will end up not evaporating as quickly. So if you’re in a climate, in an environment, where you have a high amount of evaporation, your soil water will skew towards the heavier isotope. So you can take that tomato, and take a sample of the liquid from it and run it through a mass spectrometer, and go, OK, wait a second. This is coming from somewhere that’s got this ratio of these isotopomers. And if you factor in about a dozen different trace elements, you can pinpoint pretty accurately where something comes from. JEFF POTTER: Warmer climate. Then factoring in a few of the other things, like magnesium or various trace elements, you can begin to get country of origin. That’s a huge thing for actually food fraud and food traceability. If you’ve got honey that’s being imported, how do you know where it’s coming from? GREG: Hi. How are you doing? GREG: Well, I just wanted to tell you about some things that I’ve been doing. I’ve been on a fermentation craze. My wife likes to say I didn’t buy a sports car. I started fermenting things. And one of the things I’ve been doing is– I used to brew beer years ago. And I’ve started doing it again. And I decided these spent grains ought to be useful for something. So I ground them up, pulverized them, and decided I would substitute a cup of the spent grains in a sourdough bread instead of a cup of the flour. And it’s worked out really well. IRA FLATOW: Wow. Let me get a comment. Let me remind everybody first that this is “Science Friday” from PRI, Public Radio International. In case you joined us, we’re talking with Jeff Potter, author of Cooking For Geeks, Real Science, Great Cooks, Good Food. So he’s now made double use of his. JEFF POTTER: That’s fantastic and clever and actually sounds delicious. There’s a lot of things with our cooking, where we have something that’s left over, that we then kind of just throw away. We were talking just a few minutes ago about the vanilla extract idea. You’ve got a vanilla bean left over from making a vanilla custard for the holidays or something. The idea of reusing something is fantastic. Apple peels. If you’re peeling apples, those peels can be used in a salad, for example. There’s lots of cases where you can be clever if you think about the ratio of, what is this thing? Is this carbohydrate? Is this protein? Is this sugar? What is the actual thing you’re working with? In the case of the grains that are left over from making the beer, there will be a fair amount of starches and cellulose and stuff in there that you can use as part of your bread. It will be a toothier, denser bread. But it will still taste delicious. IRA FLATOW: You answered, in your book, a question I’ve been wondering about for years. Being a watery person, loving the ocean, having gone around the world, seeing salt evaporation ponds, and I would say to myself, hey, I could do this at home. I could just get a cup of water from the ocean and make my own sea salt. But you go, uh oh. Watch out. JEFF POTTER: You can definitely do it yourself with the sea salt. But you’re also going to do it yourself with the mercury potentially. Because unlike that liquid smoke example, where you’re actually separating out something, with the do-it-yourself sea salt, you’re concentrating everything. There’s not a separation process there. It’s just a concentrations. So anything else that happens to be in the water that doesn’t evaporate away is going to be there. So I don’t know if I’d want a do-it-yourself sea salt. IRA FLATOW: No. You talked me out of that one. But you can roll your own oats, it says in the book. IRA FLATOW: Because my wife loves the steel cut oats. And I like the flat oats. So I can now make one out of the other. JEFF POTTER: You can try to do it. It’s a little bit messy. The starches end up sticking that pressed oat to whatever you roll it on pretty good. The commercial manufacturing process is a little bit easier. I think probably in your case just buy two containers. IRA FLATOW: A little time consuming. JEFF POTTER: But still really cool to see where your food comes from, to understand that process, and kind of pull back the curtain one layer, and go, how is my food being made? How can I make it? How can I dig into the science behind this a bit more? IRA FLATOW: Anything for the holiday season that you might suggest for us? Some cooking trick? I know you always say, and maybe we’ll bring this up again, you always say the best thing that you can buy, the number one thing that you can buy in the holidays, is what? JEFF POTTER: Well, besides a copy of my book. IRA FLATOW: Well, you’re talking about the thermometer. IRA FLATOW: Get a thermometer. JEFF POTTER: The number one thing I can tell anybody is get a probe thermometer because when it comes to something like a holiday roast or something cooking in the oven, it’s not about the time. It’s about the temperature. So if you take a piece of fish– and when I cook salmon, I cook it to 103 degrees Fahrenheit. And I stick a probe thermometer with a long lead. And I set the little unit to go beep, beep, beep when it hits 130. So instead of a timer telling me time to check it, it just tells me it’s done. IRA FLATOW: There you go. Thank you, Jeff. Good luck with the book. It’s great, as always. Cooking For Geeks, Real Science, Great Cooks, Good Food, now in its second edition with a lot of new tips and tricks. Give it a look. He’s also a software engineer in his spare time. I don’t know when you get that time. Thanks for joining us today. JEFF POTTER: Thanks for having me. Happy Holidays. IRA FLATOW: You too. And did you know that today is national cookie day? Just in time for the holidays. We had Jeff on the show last year to talk about his patent violating cookie recipe and for the perfect chocolate chip cookie, gooey in the center, crisp on the outside, how do you do it? Well, the secret is up there in our website, sciencefriday.com/chocolatechipcookie.